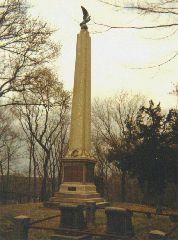 Captain John Underhill Monument in the Underhill Burying Ground, Oyster Bay, NY. Dedicated by President Theodore Roosevelt. 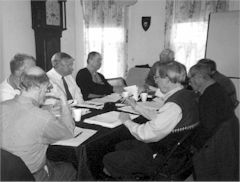 2001 Board Meeting in the Townsend House, Oyster Bay, NY. Harold Campbell; N Robert (Bob) Underhill; Mel Underhill. "Live and Love Always, Look Upward"
Click the image or "Publications"
in the menu at left. mailed out to all members! Check out our Facebook page for more information about us. Simple genealogical questions should be directed HERE. For detailed family research click Ancestral Tracing Form in the menu at left. The USA archivist, Steve Boerner, enthusiastically provides tours of the Archives & Museum and UBG, as well as the beautiful and scenic surrounding area, which he knows so well. He's usually available Monday-Wednesday, and some Sundays, but feel free to reach out and work out a date and time convenient to all. Steve is also happy to help answer questions about travel, lodging, eateries, etc. Anyone interested in visiting should reach out to Steve with as much notice as possible. Call or text at 516-996-0763. Otherwise please email at archivist@underhillsociety.org. If email addresses are rejected, I remove the addresses from the member record. If you change your email address, mailing address or phone number you should let me know, so we don't lose contact. And it would be appreciated if a relative or friend of a deceased member notifies us to remove the person from our mailing list and active roster. If, as you read this, you are moved to help fill a vacancy on the board of directors, please communicate with our President, Jay Tucker, at president@underhillsociety.org or by mail to 1033 Oleta Mill Trl, Hendersonville, NC 28792-4416. 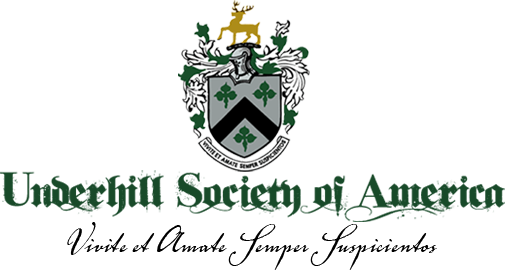 If you are not a member of the Underhill Society, please request membership by clicking the "Online Join" selection of the menu, or by mail to Membership at PO Box 712, Oyster Bay, NY 11771-0712. See Renewal Instructions. You can now use PayPal or a credit card online. Check Online Join in the menu at left for instructions. We accept PayPal or credit cards.